A python swallowed whole a 25-year-old man in Indonesia. 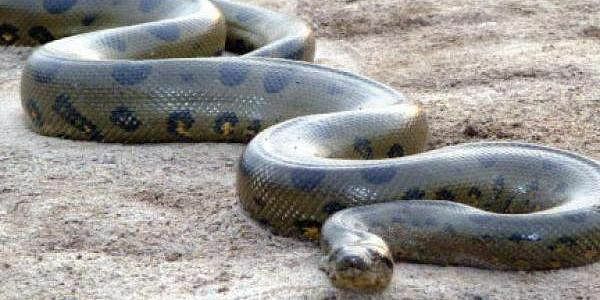 JAKARTA: A 25-year-old Indonesian man has been swallowed whole by a python on the island of Sulawesi, villagers and news reports said. A six-minute video on the website of the Tribun Timur publication shows villagers slicing open the python's carcass to reveal the legs and torso of the dead victim, named Akbar. Junaedi, the secretary of Salubiro village in West Sulawesi province, told The Associated Press that villagers began searching for Akbar on Monday night after realizing he hadn't returned from working on his palm oil crops the previous day. Junaedi said Wednesday that the search party found scattered palm oil fruit, a picking tool and a boot, and then spotted the engorged 7-meter (23-foot) -long reticulated python. "When its stomach was cut, we first saw his boot and legs near the neck," he said. "It seems he was attacked from behind because we found a wound on his back." Reticulated pythons grab onto their prey with dozens of sharp curved teeth and then squeeze it to death before swallowing it whole. They are widespread in Indonesia and other parts of Southeast Asia. Junaedi said Akbar's absence wasn't noticed until Monday because his wife was visiting her parents in another province. The alarm was raised when his uncle called on him and found his house locked. Like many Indonesians, Junaedi uses one name, as did Akbar.